Have you ever had a sales meeting where you were pitching a great product that really addressed your client’s need, only to be cast aside by your counterpart with the killer phrase: “Can you demonstrate to me how this improves our ROI (return on investment)?” Today, let me share with you how to deal with the “ROI request” in a productive way using the example of TIPS, Thinkergy’s innovation people profiling method. So, how can TIPS help you improve the ROI of your company? I explained to him how TIPS can help him identify who responds how to creative change, and who are those few people in the organization who can actually lead and drive innovative change. In short, TIPS is the right tool at the right time to solve an important problem of the company. Observing the closed body language of this prospect client, however, I realized that he was not open for a new, innovative method, and clearly is not one of those early adopters whom we target in the global roll-out of TIPS. So, it was not too surprising when he suddenly came up with the all-purpose kill-any-initiative statement: “I am willing to consider your product if you can make a very strong case how it helps us improve our ROI.” I nodded, thanked him for his time, and left. First, identify a major problem that the organization faces. Then, demonstrate how your product is able to address and resolve the problem. Finally, establish a logical causal chain that outlines how the benefits of using the product outweigh its costs, and how it improves ROI. How does this work in practice? In the following, I will make a case on how TIPS can help organizations boost their ROI by helping them to retain their top talents (through better recruitment, better alignment and better management of their talents), and by improving the innovativeness of the firm. My last article cited various studies reporting that the majority of companies perform poorly in recruiting the right person for an open position, leading to replacement costs of at least 20% of the salary. Moreover, two in three companies even admitted hiring the wrong person for the right job (i.e., people who cognitively fit the requirements of the position, but are sociopath, bullies or tyrants), leading to declining revenues, client relationships and employee motivation. The article also outlined how TIPS can ensure that companies hire the right person for the right job (and don’t hire the wrong person), thus effectively helping them to resolve the problem of a poor recruitment success ratio. How does this impact ROI? TIPS helps organizations to hire the right person for an open position. TIPS does this by making sure that the preferred cognitive styles and natural talents of a person fit the requirements of the job. If companies recruit the right people and use them in the right job, then the new recruits tend to perform easily and effortlessly in their role, and their outstanding job performance increases the ROI of the organization. TIPS also prevents organizations from hiring the wrong person for the right job. 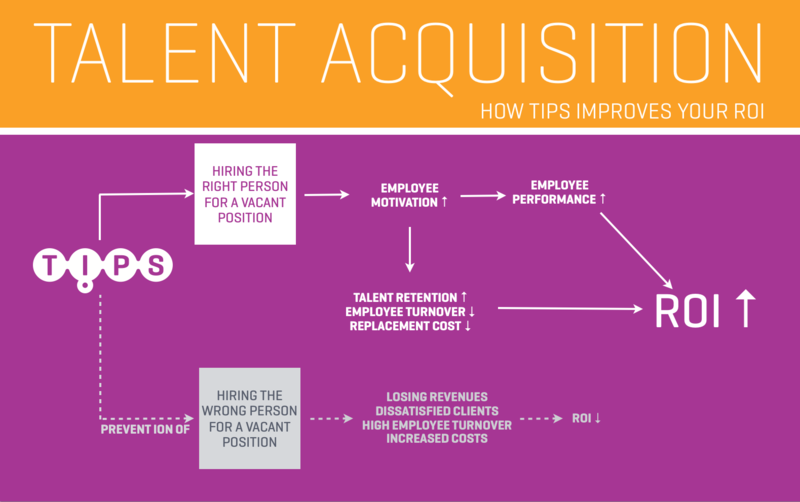 This helps avoid direct employee replacement costs, and spares organizations from the negative impacts on their bottomline (as described above) and from higher employee turnover (which in four out of five cases is rooted in bad hiring decisions, as we discussed two weeks ago). TIPS makes it likely to identify such “wrong people” ahead of time, helping you to avoid the related decreases in ROI (due to lower sales and higher employee replacement costs). High employee turnover is another major problem that many companies face. What causes this problem (apart from poor hiring practices as just discussed above)? High employee turnover may partially be attributed to the generational shifts in the modern workplace. Unlike previous generations, many Gen Y knowledge workers don’t want to labour in a job only for the money; they also want to do meaningful work. If they notice that in their present job they cannot make a positive contribution to the world, they may look for another one that promises them a better chance to make meaning. Another reason for high employee turnover may be because companies use too many of their employees in roles that do not perfectly align to their natural strengths. Put in other words, too many companies haven’t put the right person in the right job. This is a waste of talent, because each mismatch prevents a person from performing at their natural best. Evidence from many studies suggests that employees don’t leave companies, they leave bad bosses. For example, a recent Gallup study found that one in two employees left a job and company they otherwise liked because of a bad manager or immediate supervisor who doesn’t care for their needs and cannot relate to their preferred cognitive styles. (Funny enough, my move away from Deutsche Bank (whom I had loyally served for 16 years and owed a lot as they supported my studies) was triggered by a few managers who weren’t able to relate to my personality and cognitive styles). Corporate Chief Human Resource Officers, it’s time to face an inconvenient truth: Those people who volunteer to leave your company because of a hollow, misaligned job or a poor manager are typically the strong, dynamic, self-confident types; and among those who stay is a lot of deadwood. 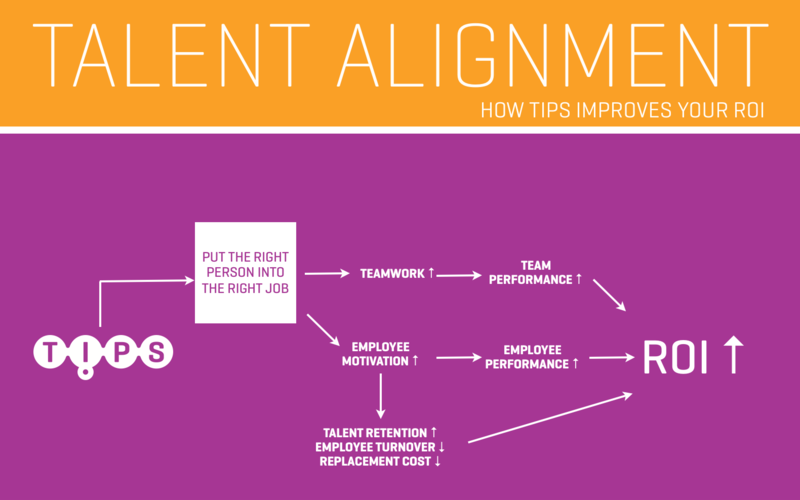 How can TIPS boost your ROI by helping you retain your top talents? 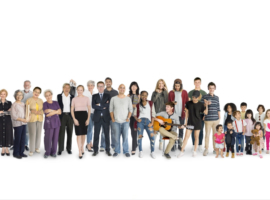 TIPS enables you to realign your talents to make sure that everyone works in a role that fits their natural talents and strengths, while having other profiles fill in for each other’s weaknesses. As Albert Einstein noted: “If you judge a fish by it’s ability to climb a tree, it will live its whole life believing it is stupid.” Fish perform easily and effortlessly in the water, as do monkeys on trees. So, TIPS allows you to align everyone in a business unit to do those things that naturally come easy to them, and to outperform effortlessly in their role. And if individual and team performance increase, so does ROI. 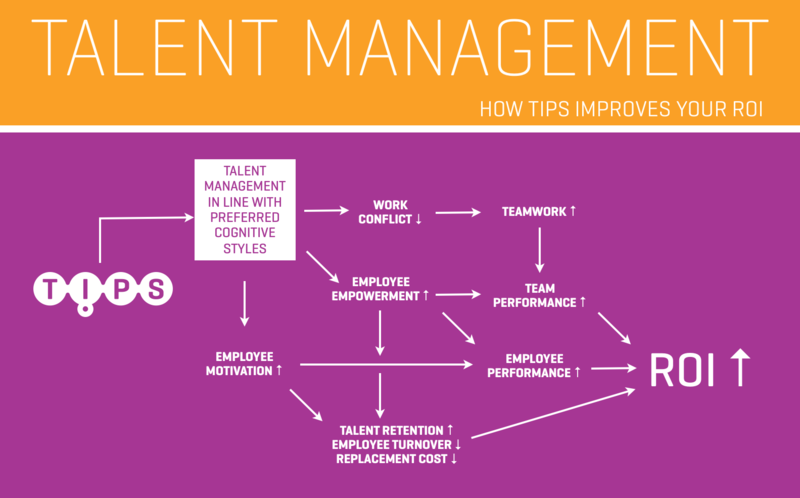 TIPS also allows you to manage each talent in harmony with their preferred cognitive styles. For example, as an Ideator, I hate being micro-managed, working on dull routine tasks and being checked upon on a daily or weekly basis. You manage Ideators like me by agreeing with them at the beginning of the year on a few ambitious growth targets and an intellectually stimulating, creative project initiative. Then, provide them the few resources that they ask for, and finally let them do the job while keeping an open door in case they seek your feedback. Putting the right person into the right job, and managing them in line with their preferred cognitive styles, both improves employee satisfaction and empowerment, and reduces the likelihood that your talents listen to other job offers or even openly look around for new opportunities. Hence, employee turnover goes down, employee replacement costs decrease, and your ROI goes up. The modern innovation economy mandates companies to either come up with more meaningful innovations or quickly fall behind in their industry. According to studies cited in an earlier article titled “How innovation affects financial performance”, innovative firms grow faster and enjoy significantly higher profit margins than their non-innovative peers. So if TIPS can help companies to become more innovative, it is likely to boost their ROI. So how does TIPS raise the innovativeness of an organization? 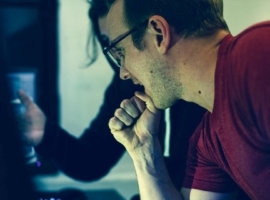 TIPS allows companies to identify those dynamic creative types who have the natural talent and drive to make meaningful new innovations happen. TIPS also gives you hints on how everyone else in the organization can contribute to the firm’s innovation efforts in harmony with their natural talents. 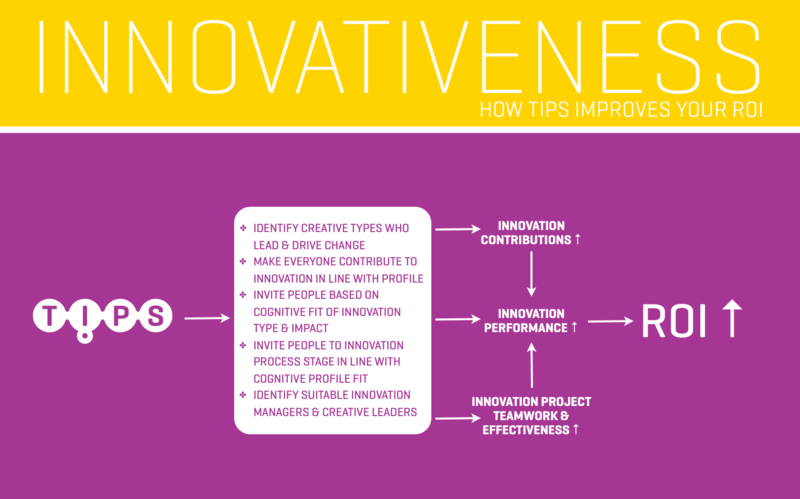 TIPS enables you to invite people to a) those kind of innovation projects (innovation type, innovation impact) that they enjoy working on, and b) the innovation process stages that they perform best at and enjoy most in a concrete innovation project. Each of these aspects increases work productivity in innovation projects. TIPS can help you find out who makes a good innovation manager to manage innovation from the back, and who makes a good creative leader to lead innovation initiatives at the front. Combined, all these TPS-powered innovation contributions will boost the innovation performance and outputs of your firm, which according to various studies, raises your ROI by 3-5% each year. At a cost of USD 88.88 per test, TIPS can significantly improve your company’s ROI by helping you to: a) improve your success ratio of recruiting the right talents for open positions, b) increase individual and team performance at work through better talent alignment, c) increase talent retention by managing people in line with their preferred cognitive styles, and d) raising your firm’s innovativeness and innovation performance. And you? When would you like to get TIPS-ed and take our new TIPS online test? Contact us to learn more about TIPS and our related training courses.